AU $112,000	Need Finance? Need Insurance? Cameo is a beautifully presented one owner boat spec'd up with in-mast furling, electric sheet winches, teak cockpit, folding wheel helm, stern mounted 'champagne' seats, high end Raymarine navigation systems, luxurious marine leather upholstery in the saloon, and a custom-made inner spring wool mattress in the v berth. 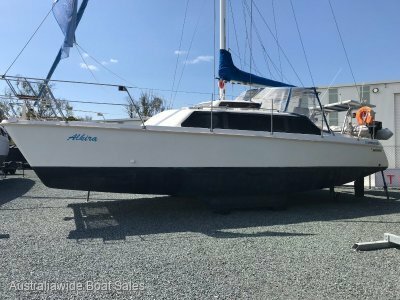 Her Volvo sail drive diesel with less than 500 hours use, is in immaculate condition and has all her maintenance history. 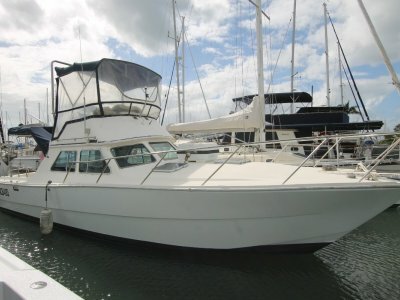 As is the hallmark of Bavaria cruisers, she is exceptionally spacious both above and below decks, she's easily sailed short handed or even solo, there is an abundance of opening ports and hatches guaranteeing plenty of natural light and ventilation' and her hull is hand laid with a Kevlar reinforced bow. Designed by Farr and is by far, the very BEST PRESENTED and BEST PRICED production cruising yacht of her size and age on the market. 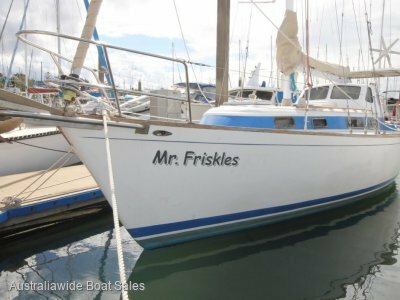 Please contact Australiawide Boat Sales Manly Qld to arrange an inspection. Fin keel with 1440kg cast iron ballast. 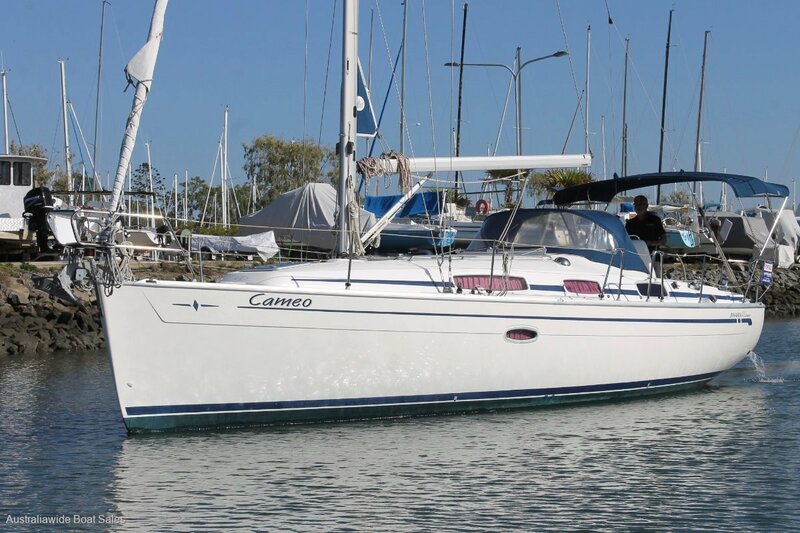 2 cabin layout with double aft cabin and heads to starboard aft, a dedicated nav station and galley opposite, two settees either side of a drop leave timber table and forward double V berth. Thirteen opening hatches & ports and 187cm headroom. L shaped galley containing a stainless steel 2 burner cooker with oven, Siemens microwave, dual stainless steel sinks with mixer tap. Top loading 12v refrigerator and front loading bar fridge. Enclosed hot and cold shower in the heads and at transom. Electric marine toilet with 80 litre holding tank. Dodger and bimini with link sheet, wheel. Companionway and cockpit table covers. General boat covers. EX-CEL anchor on bow roller with 50m of chain to a Quick electric capstan. EPIRB, manual and electric bilge pumps, flares, V sheet, fire blanket and fire extinguishers, emergency tiller. 12v / 240v shore power, 1 x start battery 3 x deep cycle gel batteries, battery isolation switches, SBC battery charger & AC/DC switch panel both new 2018. In mast furling mainsail, furling headsail. Both in very good condition. 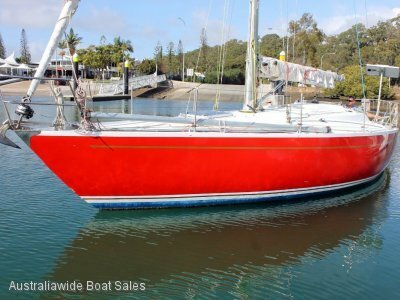 Sloop rig with deck stepped mast, double spreaders allow spars and stainless steel standing rigging (2008) and split adjustable back stay. Electric transom door / swim platform with fold out swim ladder, folding wheel helm, massive cockpit locker, dual teak "champagne' seats, all new stainless steel lifelines (NEW 2019), Stainless steel stern mounted gas BBQ, fenders and mooring lines. Slipped and antifouled October 2018.